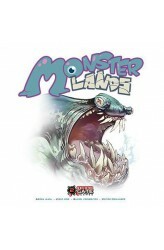 Monster Lands is a competitive dice-placement game that combines resource management, worker placement, and fun combat. You will take on the role of the leader of a small clan of brave warriors, competing to win the crown of the Lands of the Discord. You will visit buildings within the Citadel, the last bastion against the monsters that have overrun the kingdom, and also travel to the outside, the areas surrounding the Citadel, where you will battle monsters and reclaim the lands for the Queen. At the end of the game, the crown is handed to the clan with most victory points, which are gained by amassing glory, reputation, gold, and trophies from defeating monsters. The most important factor is glory; to gain it you must leave the safety of the Citadel and undertake missions.. 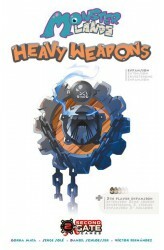 This expansion introduces new versatile and powerful components into the game, the Heavy Weapons. They have multiple activations and, unlike Traps and Defense tokens, can be brought home from battle if not used. They may allow your Mercenary to hide behind them, if activating their Defense value, or to use their immense fire power to blast Monsters out of the way or to destroy that roadblock that lets you conquer a Land. Coupled with the Heavy Weapons come the Mercenaries of the Forge Affinity. Use them by replacing those of another Affinity of choice or by adding them if you play a 5-player game. These Mercenaries have long been fiddling with the weapons as if they were pets, lets not part them from their treasures. ..